The Creator’s Cheat Sheet is a compact, beautifully designed, high-octane worksheet with everything you need to cultivate more “Aha!” moments, to give form to your creative insights, and to inspire creativity in others. And all in just 5 easy-to-follow steps! 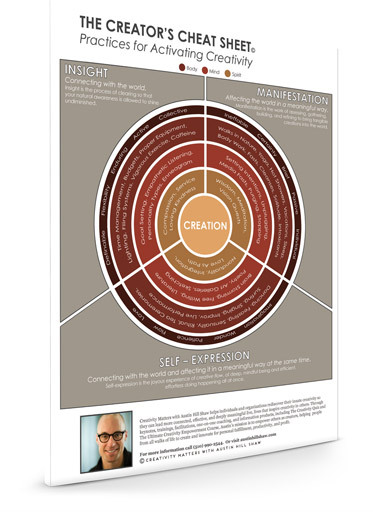 Based on over a decade’s worth of research into both creativity and our fundamental needs as human beings, the Creator’s Cheat Sheet is your essential map towards leading a more connected, effective, and deeply meaningful life. We live in a fast-paced, rapidly changing world. And now more than ever, our ability to create effects all aspects of our lives, including our career success, our relationship with others, even our physical and emotional health. With all this in mind, the Creator’s Cheat Sheet has been meticulously designed to unlock your creative potential in a quick, simple-to-follow manner.